This is an example of the amount of obstacles the Wi-Fi signal might encounter trying to reach the Access Point, marked with a yellow X. While it may seem that higher power Wi-Fi might help to improve your range, that’s not necessarily true, since higher power only helps on transmit, not receive. Also, unnecessarily high transmit power will tend to increase your interference with other Wi-Fi users, making you a bad neighbor. Usually the best way to improve range is to use a better antenna, which helps both transmit and receive. 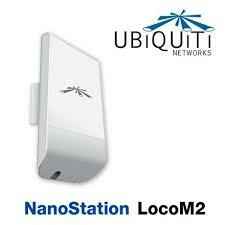 We recommend an antenas as the Ubiquiti NanoStation LocoM2, which although direcctional, is coverage area is wide enough which will help to compenstate the movment of the boat. It is also weatherproof, which suits its usage in a marine environment. If you are interested, please Contact Us, we can provide a quote in installing and configuring an antenna on your boat. 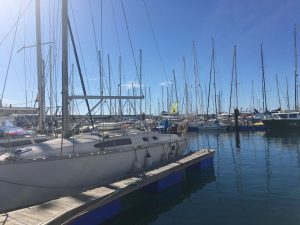 Higher antenna locations tend to have less interference from obstructions (e.g., biminis, dodgers, booms, and other very close proximity boats) than lower locations since there are more obstructions on a boat closer to deck level, so in general, it’s a good idea to locate the antenna as high as is practical. WiFi is line of sight, therefore height is important to get clear of nearby obstacles and for maximum range. VHF antennas are mounted at masthead for the same reasons. 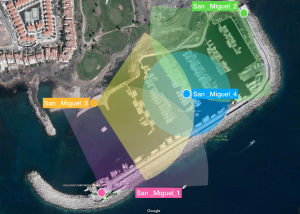 In Marina San Miguel, there are four locations of high gain Antennas. The map shows the 4 antennas, their SSIDs and the approximate area of coverage. This coverage, as stated before, may depend on the obstacles between your antenna the the base antenna.